For other uses, see Bread (disambiguation). Bread is a staple food prepared from a dough of flour and water, usually by baking. Throughout recorded history it has been a prominent food in large parts of the world and is one of the oldest man-made foods, having been of significant importance since the dawn of agriculture. Bread may be leavened by processes such as reliance on naturally occurring sourdough microbes, chemicals, industrially produced yeast, or high-pressure aeration. Commercial bread commonly contains additives to improve flavor, texture, color, shelf life, nutrition, and ease of manufacturing. Bread plays essential roles in religious rituals and secular culture. The Old English word for bread was hlaf (hlaifs in Gothic: modern English loaf), which appears to be the oldest Teutonic name. Old High German hleib and modern German Laib derive from this Proto-Germanic word, which was borrowed into Slavic (Polish chleb, Russian khleb) and Finnic (Finnish leipä, Estonian leib) languages as well. The Middle and Modern English word bread appears in Germanic languages, such as West Frisian brea, Dutch brood, German Brot, Swedish bröd, and Norwegian and Danish brød; it may be related to brew or perhaps to break, originally meaning "broken piece", "morsel". Bread is one of the oldest prepared foods. Evidence from 30,000 years ago in Europe revealed starch residue on rocks used for pounding plants. It is possible that during this time, starch extract from the roots of plants, such as cattails and ferns, was spread on a flat rock, placed over a fire and cooked into a primitive form of flatbread. The world's oldest evidence of bread-making has been found in a 14,500 year old Natufian site in Jordan's northeastern desert. Around 10,000 BC, with the dawn of the Neolithic age and the spread of agriculture, grains became the mainstay of making bread. Yeast spores are ubiquitous, including on the surface of cereal grains, so any dough left to rest leavens naturally. There were multiple sources of leavening available for early bread. Airborne yeasts could be harnessed by leaving uncooked dough exposed to air for some time before cooking. Pliny the Elder reported that the Gauls and Iberians used the foam skimmed from beer called barm to produce "a lighter kind of bread than other peoples" such as barm cake. Parts of the ancient world that drank wine instead of beer used a paste composed of grape juice and flour that was allowed to begin fermenting, or wheat bran steeped in wine, as a source for yeast. The most common source of leavening was to retain a piece of dough from the previous day to use as a form of sourdough starter, as Pliny also reported. The Chorleywood bread process was developed in 1961; it uses the intense mechanical working of dough to dramatically reduce the fermentation period and the time taken to produce a loaf. The process, whose high-energy mixing allows for the use of lower protein grain, is now widely used around the world in large factories. As a result, bread can be produced very quickly and at low costs to the manufacturer and the consumer. However, there has been some criticism of the effect on nutritional value. Bread is the staple food of the Middle East, Central Asia, North Africa, Europe, and in European-derived cultures such as those in the Americas, Australia, and Southern Africa, in contrast to parts of South and East Asia where rice or noodle is the staple. Bread is usually made from a wheat-flour dough that is cultured with yeast, allowed to rise, and finally baked in an oven. The addition of yeast to the bread explains the air pockets commonly found in bread. Owing to its high levels of gluten (which give the dough sponginess and elasticity), common or bread wheat is the most common grain used for the preparation of bread, which makes the largest single contribution to the world's food supply of any food. Bread is also made from the flour of other wheat species (including spelt, emmer, einkorn and kamut). Non-wheat cereals including rye, barley, maize (corn), oats, sorghum, millet and rice have been used to make bread, but, with the exception of rye, usually in combination with wheat flour as they have less gluten. Gluten-free breads have been created for people affected by gluten-related disorders such as coeliac disease and non-coeliac gluten sensitivity, who may benefit from a gluten-free diet. 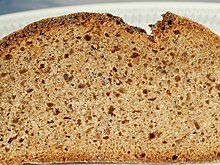 Gluten-free bread is made with ground flours from a variety of materials such as almonds, rice, sorghum, corn, or legumes such as beans, and tubers such as cassava, but since these flours lack gluten they may not hold their shape as they rise and their crumb may be dense with little aeration. Additives such as xanthan gum, guar gum, hydroxypropyl methylcellulose (HPMC), corn starch, or eggs are used to compensate for the lack of gluten. In wheat, phenolic compounds are mainly found in hulls in the form of insoluble bound ferulic acid, where it is relevant to wheat resistance to fungal diseases. Rye bread contains phenolic acids and ferulic acid dehydrodimers. Three natural phenolic glucosides, secoisolariciresinol diglucoside, p-coumaric acid glucoside and ferulic acid glucoside, can be found in commercial breads containing flaxseed. Glutenin and gliadin are functional proteins found in wheat bread that contribute to the structure of bread. Glutenin forms interconnected gluten networks within bread through interchain disulfide bonds. Gliadin binds weakly to the gluten network established by glutenin via intrachain disulfide bonds. Structurally, bread can be defined as an elastic-plastic foam (same as styrofoam). The glutenin protein contributes to its elastic nature, as it is able to regain its initial shape after deformation. The gliadin protein contributes to its plastic nature, because it demonstrates non-reversible structural change after a certain amount of applied force. Because air pockets within this gluten network result from carbon dioxide production during leavening, bread can be defined as a foam, or a gas-in-solid solution. Bread can be served at many temperatures; once baked, it can subsequently be toasted. It is most commonly eaten with the hands, either by itself or as a carrier for other foods. Bread can be dipped into liquids such as gravy, olive oil, or soup; it can be topped with various sweet and savory spreads, or used to make sandwiches containing meats, cheeses, vegetables, and condiments. Bread is used as an ingredient in other culinary preparations, such as the use of breadcrumbs to provide crunchy crusts or thicken sauces, sweet or savoury bread puddings, or as a binding agent in sausages and other ground meat products. Nutritionally, bread is categorized as a source of grains in the food pyramid and is a good source of carbohydrates and nutrients such as magnesium, iron, selenium, B vitamins, and dietary fiber. Bread crust is formed from surface dough during the cooking process. It is hardened and browned through the Maillard reaction using the sugars and amino acids and the intense heat at the bread surface. The crust of most breads is harder, and more complexly and intensely flavored, than the rest. Old wives tales suggest that eating the bread crust makes a person's hair curlier. Additionally, the crust is rumored to be healthier than the remainder of the bread. Some studies have shown that this is true as the crust has more dietary fiber and antioxidants such as pronyl-lysine, which is being researched for its potential colorectal cancer inhibitory properties. Doughs are usually baked, but in some cuisines breads are steamed (e.g., mantou), fried (e.g., puri), or baked on an unoiled frying pan (e.g., tortillas). It may be leavened or unleavened (e.g. matzo). Salt, fat and leavening agents such as yeast and baking soda are common ingredients, though bread may contain other ingredients, such as milk, egg, sugar, spice, fruit such as raisins, vegetables such as onion, nuts such as walnut or seeds such as poppy. Methods of processing dough into bread include the straight dough process, the sourdough process, the Chorleywood bread process and the sponge and dough process. Professional bread recipes are stated using the baker's percentage notation. The amount of flour is denoted to be 100%, and the other ingredients are expressed as a percentage of that amount by weight. Measurement by weight is more accurate and consistent than measurement by volume, particularly for dry ingredients. The proportion of water to flour is the most important measurement in a bread recipe, as it affects texture and crumb the most. Hard wheat flours absorb about 62% water, while softer wheat flours absorb about 56%. Common table breads made from these doughs result in a finely textured, light bread. Most artisan bread formulas contain anywhere from 60 to 75% water. In yeast breads, the higher water percentages result in more CO2 bubbles and a coarser bread crumb. One pound (450 g) of flour yields a standard loaf of bread or two French loaves. Calcium propionate is commonly added by commercial bakeries to retard the growth of molds. Flour is grain ground to a powdery consistency. Flour provides the primary structure, starch and protein to the final baked bread. The protein content of the flour is the best indicator of the quality of the bread dough and the finished bread. While bread can be made from all-purpose wheat flour, a specialty bread flour, containing more protein (12–14%), is recommended for high-quality bread. If one uses a flour with a lower protein content (9–11%) to produce bread, a shorter mixing time is required to develop gluten strength properly. An extended mixing time leads to oxidization of the dough, which gives the finished product a whiter crumb, instead of the cream color preferred by most artisan bakers. Wheat flour, in addition to its starch, contains three water-soluble protein groups (albumin, globulin, and proteoses) and two water-insoluble protein groups (glutenin and gliadin). When flour is mixed with water, the water-soluble proteins dissolve, leaving the glutenin and gliadin to form the structure of the resulting bread. When relatively dry dough is worked by kneading, or wet dough is allowed to rise for a long time (see no-knead bread), the glutenin forms strands of long, thin, chainlike molecules, while the shorter gliadin forms bridges between the strands of glutenin. The resulting networks of strands produced by these two proteins are known as gluten. Gluten development improves if the dough is allowed to autolyse. Water, or some other liquid, is used to form the flour into a paste or dough. The weight of liquid required varies between recipes, but a ratio of 3 parts liquid to 5 parts flour is common for yeast breads. Recipes that use steam as the primary leavening method may have a liquid content in excess of 1 part liquid to 1 part flour. Instead of water, recipes may use liquids such as milk or other dairy products (including buttermilk or yoghurt), fruit juice, or eggs. These contribute additional sweeteners, fats, or leavening components, as well as water. Fats, such as butter, vegetable oils, lard, or that contained in eggs, affect the development of gluten in breads by coating and lubricating the individual strands of protein. They also help to hold the structure together. If too much fat is included in a bread dough, the lubrication effect causes the protein structures to divide. A fat content of approximately 3% by weight is the concentration that produces the greatest leavening action. In addition to their effects on leavening, fats also serve to tenderize breads and preserve freshness. Bread improvers and dough conditioners are often used in producing commercial breads to reduce the time needed for rising and to improve texture and volume. The substances used may be oxidising agents to strengthen the dough or reducing agents to develop gluten and reduce mixing time, emulsifiers to strengthen the dough or to provide other properties such as making slicing easier, or enzymes to increase gas production. Salt is often added to enhance flavor and restrict yeast activity. It also affects the crumb and the overall texture by stabilizing and strengthening the gluten. 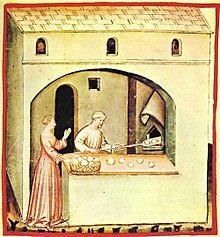 Some artisan bakers forego early addition of salt to the dough, whether wholemeal or refined, and wait until after a 20-minute rest to allow the dough to autolyse. 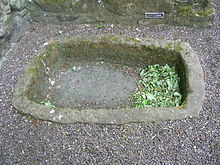 A dough trough, located in Aberdour Castle, once used for leavening bread. Leavening is the process of adding gas to a dough before or during baking to produce a lighter, more easily chewed bread. Most bread eaten in the West is leavened. A simple technique for leavening bread is the use of gas-producing chemicals. There are two common methods. The first is to use baking powder or a self-raising flour that includes baking powder. The second is to include an acidic ingredient such as buttermilk and add baking soda; the reaction of the acid with the soda produces gas. Chemically leavened breads are called quick breads and soda breads. This method is commonly used to make muffins, pancakes, American-style biscuits, and quick breads such as banana bread. Many breads are leavened by yeast. The yeast most commonly used for leavening bread is Saccharomyces cerevisiae, the same species used for brewing alcoholic beverages. This yeast ferments some of the carbohydrates in the flour, including any sugar, producing carbon dioxide. Commercial bakers often leaven their dough with commercially produced baker's yeast. Baker's yeast has the advantage of producing uniform, quick, and reliable results, because it is obtained from a pure culture. Many artisan bakers produce their own yeast with a growth culture. If kept in the right conditions, it provides leavening for many years. The baker's yeast and sourdough methods follow the same pattern. Water is mixed with flour, salt and the leavening agent. Other additions (spices, herbs, fats, seeds, fruit, etc.) are not needed to bake bread, but are often used. 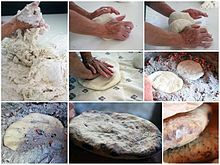 The mixed dough is then allowed to rise one or more times (a longer rising time results in more flavor, so bakers often "punch down" the dough and let it rise again), then loaves are formed, and (after an optional final rising time) the bread is baked in an oven. Many breads are made from a "straight dough", which means that all of the ingredients are combined in one step, and the dough is baked after the rising time; others are made from a "pre-ferment" in which the leavening agent is combined with some of the flour and water a day or so ahead of baking and allowed to ferment overnight. On the day of baking, the rest of the ingredients are added, and the process continues as with straight dough. This produces a more flavorful bread with better texture. Many bakers see the starter method as a compromise between the reliable results of baker's yeast and the flavor and complexity of a longer fermentation. It also allows the baker to use only a minimal amount of baker's yeast, which was scarce and expensive when it first became available. Most yeasted pre-ferments fall into one of three categories: "poolish" or "pouliche", a loose-textured mixture composed of roughly equal amounts of flour and water (by weight); "biga", a stiff mixture with a higher proportion of flour; and "pâte fermentée", which is simply a portion of dough reserved from a previous batch. Sourdough is a type of bread produced by a long fermentation of dough using naturally occurring yeasts and lactobacilli. It usually has a mildly sour taste because of the lactic acid produced during anaerobic fermentation by the lactobacilli. Sourdough breads are made with a sourdough starter. The starter cultivates yeast and lactobacilli in a mixture of flour and water, making use of the microorganisms already present on flour; it does not need any added yeast. A starter may be maintained indefinitely by regular additions of flour and water. Some bakers have starters many generations old, which are said to have a special taste or texture. At one time, all yeast-leavened breads were sourdoughs. Recently there has been a revival of sourdough bread in artisan bakeries. Traditionally, peasant families throughout Europe baked on a fixed schedule, perhaps once a week. The starter was saved from the previous week's dough. The starter was mixed with the new ingredients, the dough was left to rise, and then a piece of it was saved (to be the starter for next week's bread). The rapid expansion of steam produced during baking leavens the bread, which is as simple as it is unpredictable. Steam-leavening is unpredictable since the steam is not produced until the bread is baked. Steam leavening happens regardless of the raising agents (baking soda, yeast, baking powder, sour dough, beaten egg white) included in the mix. The leavening agent either contains air bubbles or generates carbon dioxide. The heat vaporises the water from the inner surface of the bubbles within the dough. The steam expands and makes the bread rise. This is the main factor in the rising of bread once it has been put in the oven. CO2 generation, on its own, is too small to account for the rise. Heat kills bacteria or yeast at an early stage, so the CO2 generation is stopped. Salt-rising bread employs a form of bacterial leavening that does not require yeast. Although the leavening action is inconsistent, and requires close attention to the incubating conditions, this bread is making a comeback for its cheese-like flavor and fine texture. Aerated bread was leavened by carbon dioxide being forced into dough under pressure. From the mid 19th to mid 20th centuries bread made this way was somewhat popular in the United Kingdom, made by the Aerated Bread Company and sold in its high-street tearooms. The company was founded in 1862, and ceased independent operations in 1955. The Pressure-Vacuum mixer was later developed by the Flour Milling and Baking Research Association for the Chorleywood bread process. It manipulates the gas bubble size and optionally the composition of gases in the dough via the gas applied to the headspace. The organic baker Andrew Whitely, writing in The Independent, called the process "the covert corruption of our daily food". Bread has a significance beyond mere nutrition in many cultures because of its history and contemporary importance. Bread is also significant in Christianity as one of the elements (alongside wine) of the Eucharist, and in other religions including Paganism. 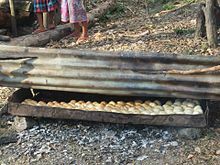 In many cultures, bread is a metaphor for basic necessities and living conditions in general. For example, a "bread-winner" is a household's main economic contributor and has little to do with actual bread-provision. This is also seen in the phrase "putting bread on the table". The Roman poet Juvenal satirized superficial politicians and the public as caring only for "panem et circenses" (bread and circuses). In Russia in 1917, the Bolsheviks promised "peace, land, and bread." The term "breadbasket" denotes an agriculturally productive region. 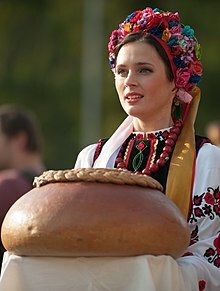 In Slavic cultures bread and salt is offered as a welcome to guests. In India, life's basic necessities are often referred to as "roti, kapra aur makan" (bread, cloth, and house). Words for bread, including "dough" and "bread" itself, are used in English-speaking countries as synonyms for money. A remarkable or revolutionary innovation may be called the best thing since "sliced bread". The expression "to break bread with someone" means "to share a meal with someone". The English word "lord" comes from the Anglo-Saxon hlāfweard, meaning "bread keeper." Bread is sometimes referred to as "the staff of life", although this term can refer to other staple foods in different cultures: the Oxford English Dictionary defines it as "bread (or similar staple food)". This is sometimes thought to be a biblical reference, but the nearest wording is in Leviticus 26 "when I have broken the staff of your bread". The term has been adopted in the names of bakery firms. ^ a b Harper, Douglas. "bread". Online Etymology Dictionary. ^ "The Etymology of the Word 'Bread'". Bon Appetit. Retrieved 30 September 2016. ^ "Prehistoric man ate flatbread 30,000 years ago: study". Physorg.com. Agence France-Presse. 19 October 2010. Retrieved 19 October 2010. ^ "Prehistoric bake-off: Scientists discover oldest evidence of bread". BBC. 17 July 2018. Retrieved 17 July 2018. ^ McGee, Harold (2004). On food and cooking. Scribner. p. 517. ISBN 978-0-684-80001-1. ^ Tannahill, Reay (1973). Food in History. Stein and Day. pp. 68–69. ISBN 978-0-8128-1437-8. ^ fob.co.uk: "History of bread – 20th century"
^ Peña, R. J. "Wheat for bread and other foods". Food and Agriculture Organization. Retrieved 1 October 2016. Wheat, in the form of bread, provides more nutrients to the world population than any other single food source. ^ "Wheat". Grains & Legumes Nutrition Council. Retrieved 1 October 2016. Aside from bread wheat and durum, other types of wheat include spelt, emmer, einkorn and kamut. These wheat varieties are commonly referred to as ‘ancient’ grains and are increasingly being used in the manufacture of niche wheat-based food products. ^ Cauvain, Stanley (2015). Technology of Breadmaking. Springer. p. 377. ISBN 978-3-319-14687-4. In the past, maize (corn), barley, oats, sorghum, millet and rice have all found their way into bread products at some time, usually when wheat and rye have been in short supply. ^ Lamacchia C, Camarca A, Picascia S, Di Luccia A, Gianfrani C (2014). "Cereal-based gluten-free food: how to reconcile nutritional and technological properties of wheat proteins with safety for celiac disease patients". Nutrients (Review). 6 (2): 575–90. doi:10.3390/nu6020575. PMC 3942718. PMID 24481131. ^ Mulder CJ, van Wanrooij RL, Bakker SF, Wierdsma N, Bouma G (2013). "Gluten-free diet in gluten-related disorders". Dig. Dis. (Review). 31 (1): 57–62. doi:10.1159/000347180. PMID 23797124. The only treatment for CD, dermatitis herpetiformis (DH) and gluten ataxia is lifelong adherence to a GFD. ^ Hischenhuber C, Crevel R, Jarry B, Mäki M, Moneret-Vautrin DA, Romano A, Troncone R, Ward R (1 March 2006). "Review article: safe amounts of gluten for patients with wheat allergy or coeliac disease". Aliment Pharmacol Ther. 23 (5): 559–75. doi:10.1111/j.1365-2036.2006.02768.x. PMID 16480395. For both wheat allergy and coeliac disease the dietary avoidance of wheat and other gluten-containing cereals is the only effective treatment. ^ Gelinas, Pierre; McKinnon, Carole M. (2006). "Effect of wheat variety, farming site, and bread-baking on total phenolics". International Journal of Food Science and Technology. 41 (3): 329. doi:10.1111/j.1365-2621.2005.01057.x. ^ Boskov Hansen, H.; Andreasen, M.F. ; Nielsen, M.M. ; Melchior Larsen, L.; Bach Knudsen, K.E. ; Meyer, A.S.; Christensen, L.P. & Hansen, Å. (2002). "Changes in dietary fibre, phenolic acids and activity of endogenous enzymes during rye bread-making". European Food Research and Technology. 214: 33. doi:10.1007/s00217-001-0417-6. ^ Strandås, C.; Kamal-Eldin, A.; Andersson, R.; Åman, P. (2008). "Phenolic glucosides in bread containing flaxseed". Food Chemistry. 110 (4): 997–99. doi:10.1016/j.foodchem.2008.02.088. PMID 26047292. ^ a b Wieser, Herbert (1 April 2007). "Chemistry of gluten proteins". Food Microbiology. 3rd International Symposium on Sourdough3rd International Symposium on Sourdough. 24 (2): 115–19. doi:10.1016/j.fm.2006.07.004. PMID 17008153. ^ McGee, Harold (2004). On Food and Cooking: The Science and Lore of the Kitchen. New York: Scribner. pp. 515–80. ^ Grotts, Lisa Mirza (21 June 2011). "Bread and Butter Etiquette". Huffington Post. Retrieved 2 October 2016. ^ "Sandwich Recipes". Simply Recipes. Retrieved 2 October 2016. ^ Winkler, Sarah (29 July 2009). "Discovery Health "Is eating bread crust really good for you?"". Health.howstuffworks.com. Retrieved 26 October 2012. ^ Hofmann, T.; Lindenmeier, M.; Somoza, V. (2005). "Pronyl-Lysine—A Novel Protein Modification in Bread Crust Melanoidins Showing in Vitro Antioxidative and Phase I/II Enzyme Modulating Activity". Annals of the New York Academy of Sciences. 1043: 887. Bibcode:2005NYASA1043..887H. doi:10.1196/annals.1333.101. ^ Panneerselvam, J.; Aranganathan, S.; Nalin i, N. (2009). "Inhibitory effect of bread crust antioxidant pronyl-lysine on two different categories of colonic premalignant lesions induced by 1,2-dimethylhydrazine". European Journal of Cancer Prevention. 18 (4): 291–302. doi:10.1097/CEJ.0b013e32832945a6. PMID 19417676. ^ Panneerselvam, Jayabal; Aranganathan, Selvaraj; Nalini, Namasivayam (2009). "Inhibitory effect of bread crust antioxidant pronyl-lysine on two different categories of colonic premalignant lesions induced by 1,2-dimethylhydrazine". European Journal of Cancer Prevention. 18 (4): 291–302. doi:10.1097/CEJ.0b013e32832945a6. PMID 19417676. ^ "Bread recipes (45 results found)". British Broadcasting Corporation. Retrieved 2 October 2016. ^ Finley, John H.; Phillips, R. O. (1989). Protein quality and the effects of processing. New York: M. Dekker. p. See Figure 2. ISBN 978-0-8247-7984-9. ^ "Calcium Propionate". JRank. Retrieved 1 October 2016. ^ Hunter, Gary; Carey, Patrick; Tinton, Terry; Walpole, Steven (2007). Professional Chef: Level 2 Diploma. Cengage Learning EMEA. pp. 10–11. ISBN 978-1-84480-706-2. ^ Hydration ratio for breads Archived 14 January 2013 at the Wayback Machine. Food.laurieashton.com (5 June 2009). Retrieved 21 March 2013. ^ "Yeast & Baking Lessongs. Liquids". Red Star Yeast. Retrieved 2 October 2016. ^ Young, Linda; Cauvain, Stanley P. (2007). Technology of Breadmaking. Berlin: Springer. p. 54. ISBN 978-0-387-38563-1. ^ Tenbergen, Klaus (1999). "Dough and Bread Conditioners". Food and Product Design Magazine. Retrieved 2 October 2016. ^ a b c d e f "The Bread Leavening Process". Becoming a Chef. 15 August 2016. Retrieved 2 October 2016. ^ Young, Linda; Cauvain, Stanley P. (2007). Technology of Breadmaking. Berlin: Springer. p. 79. ISBN 978-0-387-38563-1. ^ "Artisan bread baking tips: Poolish & biga". Weekend Bakery. Retrieved 2 October 2016. ^ a b Davidson, Alan (1999). The Oxford Companion to Food. Oxford University Press. pp. 756–57. ISBN 978-0-19-211579-9. ^ Gobbetti, Marco; Gänzle, Michael, eds. (2012). Handbook on Sourdough Biotechnology. Springer. ISBN 978-1-4899-9189-8. ^ Mesure, Susie (30 January 2016). "Supermarkets cash in on sourdough bread craze as popularity surges". The Independent. Retrieved 2 October 2016. ^ Edwards, W.P. (2007). The science of bakery products. Cambridge: Royal Society of Chemistry. p. 68. ISBN 978-0-85404-486-3. Retrieved 8 December 2012. When bread expands in the oven the resulting expansion is known as oven spring. It has been calculated that water expansion was responsible for some 60% of the expansion. ^ "Susan R. Brown's Salt Rising Bread Project". Home.comcast.net. Archived from the original on 30 June 2012. Retrieved 3 June 2010. ^ Richardson MD FRS, Benjanmin Ward. On the Healthy Manufacture of Bread: A Memoir on the System of Dr. Dauglish. Baillière, Tindall, & Cox, 1884. pp. 18, 20–21, 34, 62–63, 67–70, 74. ^ Kilcast, D.; McKenna, B. M., eds. (2003). Texture in food. Woodhead. p. 448. ISBN 978-1-85573-724-2. ^ Whitely, Andrew (23 August 2006). "The shocking truth about bread". The Independent. Retrieved 2 October 2016. ^ Sabrina, Lady (2006). Exploring Wicca: The Beliefs, Rites, and Rituals of the Wiccan Religion. Career Press. pp. 100–. ISBN 978-1-56414-884-1. ^ "Russia". Encyclopædia Britannica. Retrieved 3 June 2010. ^ "Vladimir Lenin: From March to October. SparkNotes". Sparknotes.com. Retrieved 3 June 2010. ^ "Russian Traditions, the "Bread and Salt" Custom". To Discover Russia. Archived from the original on 5 October 2016. Retrieved 2 October 2016. ^ Patel, K.V. (2014). The Foundation Pillars for Change. Partridge. p. 54. ISBN 978-1-4828-1563-4. ^ Molella, Art (8 February 2012). "How the Phrase 'The Best Thing Since Sliced Bread' Originated". The Atlantic. Retrieved 30 September 2016. ^ "Break bread with". The Free Dictionary. Retrieved 1 January 2017. ^ "Lord". Merriam-Webster. Retrieved 1 January 2017. ^ "The staff of life". Cambridge Dictionary. Retrieved 20 April 2018. ^ "Staff". Oxford English Dictionary (3rd ed.). Oxford University Press. September 2005. (Subscription or UK public library membership required.) OED cites 1638 "Bread is worth all, being the Staffe of life" but also 1901 "Broad beans form one of the staves of life in Sicily". ^ "Leviticus 26:26". Bible Study Tools. Retrieved 20 April 2018. Cunningham, Marion (1990). The Fannie Farmer cookbook. illustrated by Lauren Jarrett (13th ed.). New York: Alfred A. Knopf. ISBN 978-0-394-56788-4. Trager, James (1995). The food chronology: a food lover's compendium of events and anecdotes from prehistory to the present. Henry Holt. ISBN 978-0-8050-3389-2. Davidson, Alan (1999). The Oxford Companion to Food. Oxford University Press. ISBN 978-0-19-211579-9. D. Samuel (2000). "Brewing and baking". In P.T. Nicholson; I. Shaw (eds.). Ancient Egyptian materials and technology. Cambridge: Cambridge University Press. pp. 537–76. ISBN 0-521-45257-0. Pyler, E.J. (1988). Baking Science & Technology 3rd Ed. vols. I & II. Sosland Publishing Company. ISBN 978-1-882005-02-4.